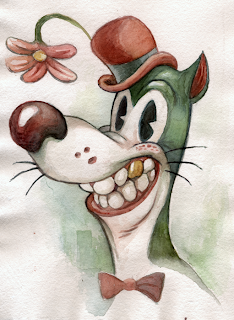 Aside from a number of early Fleischer Brothers cartoons that proudly wore their insanity on their sleeves, one of my biggest artistic inspirations is TEETH. Maybe it has something to do with the way they affect our perception of other people, sometimes more so than other prominent facial features. This week's picture was another exercise in slowly building up lots of layers of color. It helps to first apply water to large areas that you want to fill with the same color, and for some reason I routinely forget this! It's not as alarming as I'd like it to be (if you find that hard to believe I don't blame you) but there's always next time!